Finding trails in the Quad Cities just got a whole lot easier. A “one-stop-shop” for non-motorized trails, QC Trails connects you to information about regional trails and gives you tools to keep track of all your trail adventures. With a free QC Trails account, keep track of all the trails you have completed. 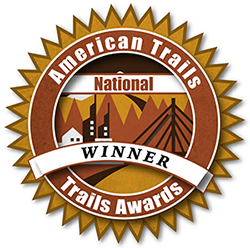 Use “My Trails” to record the date you completed a trail, make notes about your experience, keep track of how far you hiked, biked, jogged, skied, or paddled. This place is a gem, beautiful trails, woods, and views of amazing wildlife within the heart of the city. Keep a bucket list of trails that you plan to do one day soon. Accumulate badges when you complete different trail challenges. QC Trails promotes the discovery and use of trails for both fun and fitness. Learn more about the health and wellness benefits of outdoor recreation through the Be Healthy QC initiative.